Yeah, I had maybe gone through some deforestation. It was in SW, I should have made that clear. Hello everyone, I was wondering if anyone else noticed this. I had just come back from the ruins in RoG back to SW only to hear Wickerbottom say "That sounds quite large." So, I grab my cutlass and head out. As soon as the Sealnado is setting up to do his S U C C attack, I jump onto my boat, as the only thing he could do to you on a boat, if he was on land doing the S U C C attack, was decrease your sanity. However, to my complete surprise and shock, the absolute madlad brought my boat onto land, which instantly broke it, and this then caused my poor Wicker to be S U C C D. As I now had to fight without a boat, I realized I would have to chase him to a peninsula and wait on the other side of it when he does the S U C C attack. However, while he could luckily not S U C C me across the gap, he was trying to, as Wicker was hoisted into the air if I was in range of him, but protected from him by an inlet of the sea. Was this a recent feature, because I have never had this issue with him in my 1000 days of SW+RoG. Btw this is a Hamlet compatible file. I do have to say, I have not had such a stressful fight in ages, so it was an entertaining change. Anyone found any flotsam recently? Wow, I have no idea why I didn't think to do that, thanks. I made a kitchen, but used smelters and chests. Was gonna say "how much alloy could one person need?" then I saw the day count. Hey everyone, I was wondering if it was just that I was unlucky, not searching for it enough, or if people know if this feature was removed, but flotsam is something I have not seen in a few years and would like to know what happened to it. Any ideas? Yeah, I agree. I really hate hound attacks only because resetting everything is still a pain. Thank you so much, friends at Klei! How can I spawn a "dead" Monkey Barrel? Do Rock Lobsters Still Overpopulate? How did you bring them to Hamlet, can friends travel via the Sky/Seaworthy? I ******* knew it as soon as I started reading the post. Good one though. My excitement is immeasurable, and my day has been made. 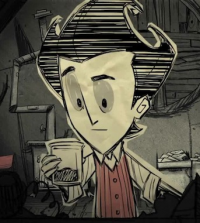 Thank you for helping so much, Klei. You are the best!